(MoneyWatch) Although gathering with family and friends is the highlight of the holiday season, even the most perfectly planned dinner party will fall flat if your house burns down. Monitor your holiday lights. According Travelers, faulty wiring and outlets are two of the leading causes of house fires. If you're using electrical cords to power holiday lights and other seasonal decorations, check them for signs of fraying and replace them if they're worn. Don't cover electrical cords with rugs or tree skirts, and don't overload your home's electrical system. Check all lights before putting them on the tree, and buy new strands if the old ones are damaged. If you're plugging in multiple decorations or appliances, be sure you understand the difference between a surge protector and a power strip. Both allow you to plug in multiple devices, but only a surge protector will prevent prevent damage in the event of a power spike. Will shadow inventory derail housing recovery? Keep the house warm. It's not just for comfort -- a cold house often means freezing pipes, which if they burst could cause thousands of dollars' worth of flood damage. When it's cold outside, your home's temperature should be at least 65 degrees, and all attics, basements and crawl spaces should be properly insulated. The house will be cozier, and it's less likely that ice dams -- which can cause roof collapse or flooding -- will form on your roof. Before using your furnace, have it checked by a professional to ensure it's in good working order. If need be, replace or fix it before cranking it up for the winter. Be smart with alternative forms of heat. If you live in an old, drafty home or simply don't have a powerful heating system, space heaters may be required to keep warm this winter. Pay attention to safety procedures, and avoid using an older heater when possible. Most fires caused by space heaters could have been prevented with a little attention to detail. Don't place space heaters, pellet stoves or wood-burning stoves near anything that could potentially catch fire, and be sure to keep Christmas trees, drapes and furniture away from heat sources. If you plan to use a fireplace, have the chimney cleaned and inspected by a certified chimney sweep. Make any necessary repairs before starting a fire. Cook like a pro. Most professional kitchens have a fire extinguisher, and yours should, too. Keep it readily available and know how to use it in case flames erupt while you're cooking. Never leave pots or pans unattended on the stove, and keep all paper products and towels away from open flames. Not all kitchen fires are created equal. If a grease fire erupts, do not throw water on it -- that will cause the fire to spread. Instead, turn off the heat source or put a lid on the pan. For stove or microwave fires, keep the door closed and, in the case of stoves, turn off the heat to smother the flames. 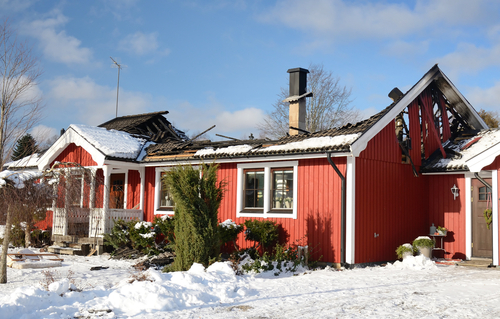 Don't open the door until the fire is completely out, and unplug the appliances only if you can reach them safely. Don't forget the exterior. It's not just interior issues that pose threats. Before throwing any holiday parties, maintain all the steps and handrails outside your home. Broken stairs and banisters can become major hazards when covered in snow and ice, so make repairs early to prevent someone from falling and getting injured. Hire a licensed professional to trim trees to remove dead branches. If weakened by heavy snow and ice, these limbs could fall and hurt someone, or cause damage to your house. Prevent ice dams and a potential roof collapse by removing leaves, sticks and other debris from your gutters. This will allow melting snow and ice to flow freely instead of backing up under the roof shingles.